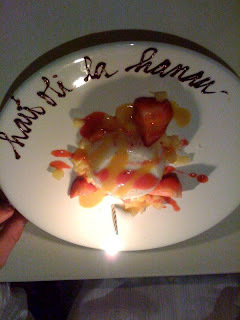 so, since the hub totally jacked up my restaurant choice for his birthday dinner - ha! - we did, indeed, go to roy's. we love anything that reminds us of hawaii, and so i knew that it would be a hit. note: these are all quickie pics snapped with the iPhone, so they're crappy as hell, but better than nothing, yes? 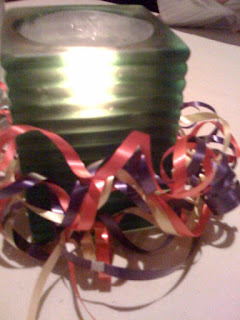 we were seated quickly, and i was amused at the birthday decor at our table. he'd also been greeted with a "happy birthday, mr. wan!" by both the hostess and our server. he looked pleased when they both assured him that they wouldn't sing. heh. my husband is the opposite of me when it comes to his birthday - he wants no attention and no acknowledgment. no birthday tiara for him! 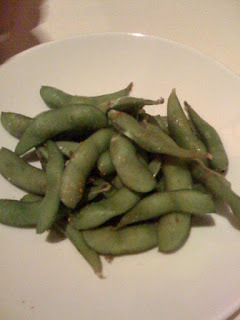 our edamame was yummy and spicy. as much as i love bread with dinner, these were a nice change. 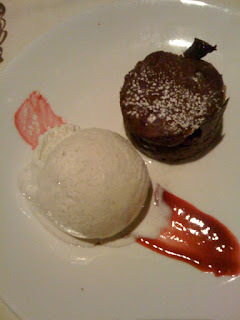 i'd decided to go with their prix fixe menu - it was a great deal, and i always love a bargain. i didn't actually start taking pictures of our food until after we'd received our entrees, but trust me - everything was super delicious. i chose their pulehu style "kalbi" sirloin, served with kimchee and edamame fried rice, while the hub opted for their lakanilau roll: crab, asparagus, and avocado wrapped in rice and then topped with slices of seared kobe beef. we ate monkey-style, trading places halfway through, and mowed through those appetizers like they were going out of style. 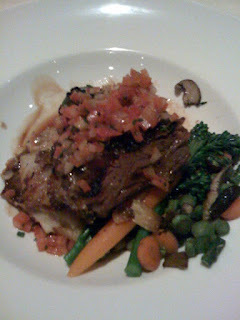 my entree was the "hawaii kai" style beef short ribs, served with potatoes and veggies. 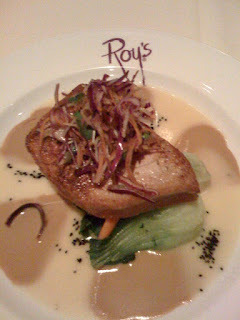 the hub went with the blackened ahi, served with a spicy soy mustard butter sauce. he liked it, but found that the mustard was a bit overpowering and ended up eating it on his appetizer plate. oh, well. i'd heard from several trusted sources that while roy's served great food, the service tended to be a bit spotty. and maybe it was, but we weren't in any big hurry and enjoyed the time alone. i gave him the card i'd made (sorry, you don't get to see that) and a copy of "quantum of solace" on dvd. of course, he knows me too well and had already figured out what i was giving him when he noticed that our rental movies, sitting on the counter at home, were gone. i'm really bad at surprises. but he had to admit that he had no idea where we were going until i pulled up at the restaurant. yay for me! we left stuffed and happy. and it was over so quickly - by the time we pulled up at the thimble, we'd only been gone for two hours. and amazingly, the bean was fast asleep when we walked inside, and MIL was happily relaxing with a book and some HGTV. they'd had a great time playing together, having dinner, and then she settled down easily, with no crying or fussing. she used to cry for a good 15 minutes before falling asleep if i wasn't around. ah, this makes planning date nights much easier for the future! 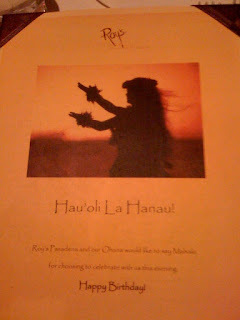 Hau'oli la hanau is happy birthday in Hawaiian. Glad you had a great dinner! I'm glad the food was good! Looks pretty nice for a chain, no? Yay! You guys look so cute together. Happy birthday, Mr. Wan! Yay, you guys went to Roy's! I was hoping you would. I'm sad there was no ukulele. What a sweet birthday! I bet he enjoyed spending it with his favorite girl! I'm glad the birthday dinner was a success! 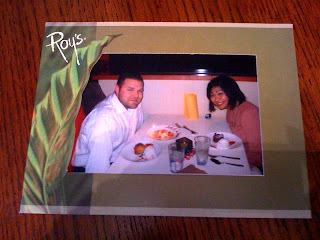 happy birthday wishes for the hubs...ohh roy's, a great apps and dessert place! 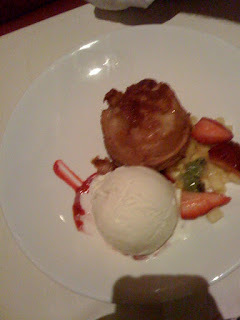 our friend is an executive chef at the roy's in SD, so when we were down there one time, we got hooked up. yayyayayayayaya for a happy happy birthday for mr. wan. Yummy!! Happy Birthday Mr. Wan!! 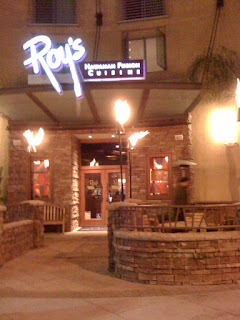 I don't even know anyone who eats at Roy's in Hawaii anymore. They have cooler dudes now... like. Alan Wong? I love Roy's. We have the same celebratory photo from a birthday. Hehe.